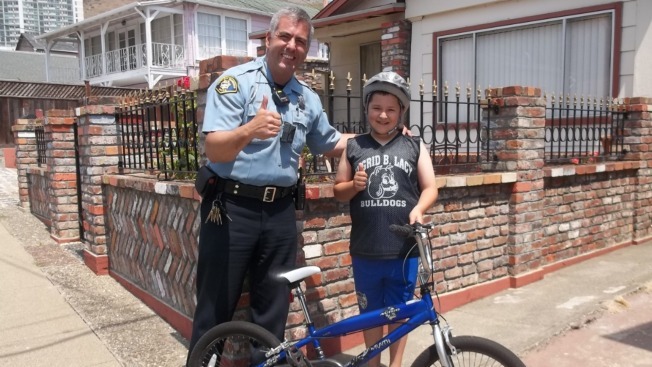 A 10-year-old boy brought to tears after his green bicycle was stolen from a South San Francisco library last week is riding on a new set of wheels thanks to a kind-hearted member of the city's police force. Brian Lara of South San Francisco and his mother stopped by the Grand Avenue Library last week to quickly use a computer, according to Police Service Technician Nelson Primo. When they went to grab the boy's bike roughly 10 minutes later, it was gone. The boy and his mother promptly alerted police, and Primo was dispatched to the scene. He was greeted by a distraught youngster. "I saw his face," Primo said. "His spirit was broken. He lost his bike. He was super sad. It made me sad, too." Moved by the boy's ordeal, Primo decided to conduct an undercover surprise. He had a new bicycle sitting at his home that his son was not using. The police service technician decided to put it to good use. One day after the boy's bike was stolen, Primo said he called the family and asked if he could come over to ask some follow-up questions regarding the theft investigation. Unbeknownst to the family, Primo did not really come with many questions to ask. Instead, he had a special treat up his sleeve. Primo popped his trunk and whipped out a fresh, blue bicycle just for the astonished boy. "I was so happy," Lara said. "I like the bike because I like the color blue. It was good cause the green bike hurt my feet. This bike is better." Primo noted that his gesture did not just bring a smile to the boy's face. "It makes me super happy," he said. "It is a great opportunity to build bridges to impact the South San Francisco community."